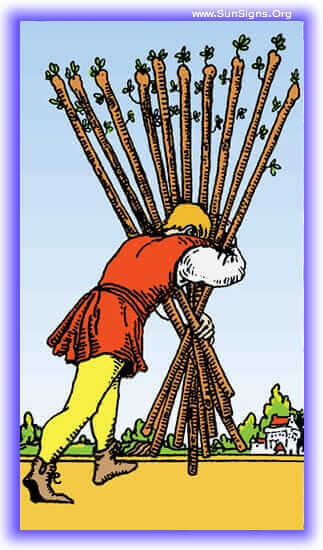 The Ten of Wands represents the traveler bearing the last of his burdens. It is large, and almost more than he can bear, but his perseverance has bore him thus far, and it shall bear him over the last stretch. At the end of his trek lay his reward, for the burden he carries are the fruits of his own labor, and that makes their weight all the sweeter. This tarot card represents the end of a cycle within the Minor Arcana of the Tarot, and thus the end of a journey. You have reached the end of a journey, bearing your harvest to market. Your goal achieved, you must be careful to remain aware that when one harvest is reaped, you remain responsible for the sowing of the crop of the next season. Sometimes this requires placing others in command seats, and ensuring that you maintain a balance between work and play lest you become overwrought. Congratulations! You’ve recently passed a day of reward, and the completion of a cycle. You have received your rewards, and the moment of respite that follows. But be aware having achieved this, and it’s moments past, that it’s time to look forward to the future. The burden is heavy, but you can carry it. This tarot card shows up here when it’s crunch time, and it’s time to gather your harvest to bring it off to sell at market. Continue on, and soon your period of rest and reward will come, to be followed by new beginnings. Things may be moving along smoothly now, and they will continue to do so. But the difficult final crunch is about to come. You can handle the burden, but you’ll need to buckle down and push through to reap your reward. Hold yourself together, prepare now, and you’ll make it through another year. Sometimes it is habit alone, or a feeling of obligation, that makes us continue to carry a large burden. 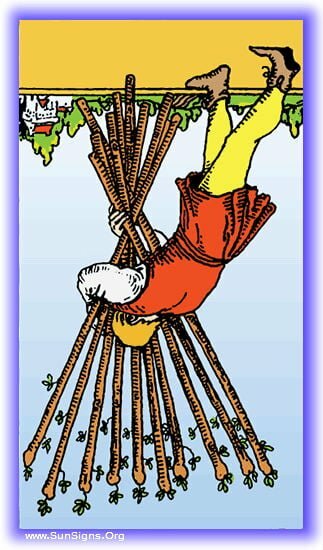 The Ten of Wands card showing up in reverse position is a warning that you need to learn to delegate effort, or release responsibilities that are no longer yours to carry. It is especially worrisome if you are only continuing to carry these out of a feeling of guilt. The burden has been carried long and long. Long past it’s due, long past your responsibility. It’s been weighing you down and doing you no measure of harm. Maybe you’ve already set it down, but if you haven’t, it’s long past time for you to do so. Put down the cross, somebody needs the wood. Whatever this burden is you’re carrying, it’s no longer yours to carry. Set it down friend, your obligation to it has passed. Delegate it to others, or inform others that it’s time for you to pass the torch. Do it without guilt, you have met your obligation. The time is coming when someone will try to foist a responsibility upon you which is not yours. With the situation being what it is at this time, you’re going to be inclined to take it up and carry it. Do not fall for it, the burden is not yours, and this tarot card appearing is your calling to stand up for yourself and not carry burdens for which you are not responsible.